The women's Huskie basketball team celebrates their fourth conference title in program history (photo by Josh Schaefer). 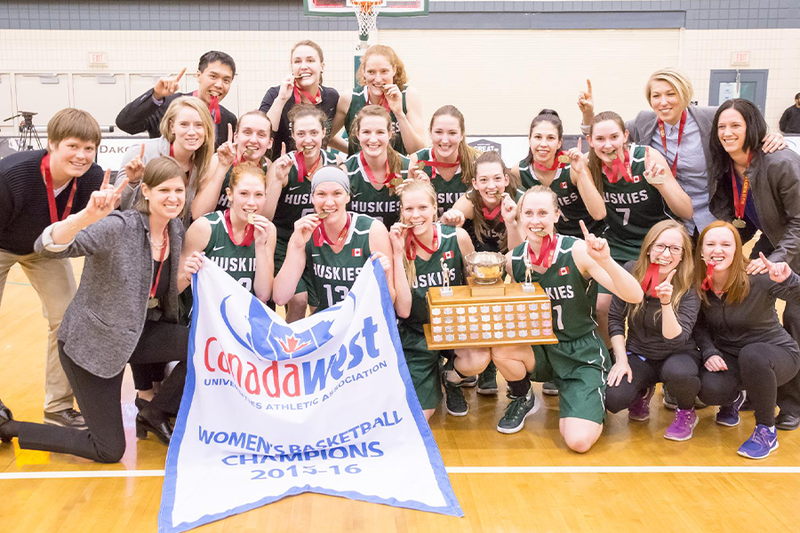 The University of Saskatchewan Huskies prevailed 73-62 over the University of Regina Cougars in an all-Saskatchewan Canada West Final Saturday night at the PAC to claim their fourth conference title in program history. Saskatchewan outscored Regina 24-8 in the third quarter to build up an insurmountable lead heading to the fourth. The Huskies closed the third on a 15-2 run to take a 61-39 lead after three quarters. Regina pushed back in the fourth quarter with a 20-4 run in the fourth quarter, but the Huskies still held an 11 point lead and sealed the victory with a Desarae Hogberg three ball with 1:31 remaining. The Huskies put up 22 points in the second quarter while holding the Cougars to just 13 in order to lead 37-31 at halftime after trailing Regina 18-15 at the end of the opening 10 minutes. "That's the best we've played all year and that's all you can ask for, to be playing your best basketball in March," said Huskie head coach Lisa Thomaidis. "They've put in the time and the energy, for them to come out and perform like that...I couldn't be happier for them."